Now the pictures are done.... Some words to go with it. Mine (and many others) have a huge clunk noise when the tail is moved, and then the tail doesn't hold in "dino mode". The clunk you would think is the ratchet.... But it's not. The cross piece that is supposed to hold the ratchet in place only has a couple of mm of grab into the ratchet. The noise is this jumping/snapping/clunking out of the ratchet piece, and the fact that there is a spring means the ratchet peices can be pushed out of the way so the tail can move. The tail doesn't move far enough (90 deg) to get to the other slot. There is a circle moulded with/around the ratchets cross (picture a circle with a cross in it) so the uniform plain can't "fall" into place as it is always touching the circle. So he has dodgy hips AND a dodgy tail ratchets? Man, trippers is really showing his age. Have you guys started a thread here at OTCA for all the various mods and stuff, be nice to get all this info in one technical thread. Similar stuff over at TFW but it tends to sprawl into various threads making it hard to follow. Be nice to have a resource of all ideas and suggested fixes in one place for people that have him, and the many more over the following year who will be asking for these bits of technical help etc. I'm hoping that the Trypticon I have on order will come from a later wave where they have fixed this hip problem. Or that TakraraTomy will fix it by the time they release theirs. My figure is having the same problem with its tail as Krayt described. After having to open up one of the hips to fix the assembly and finding that a massive ordeal, the idea of taking the tail apart is incredibly daunting. Doubly so as I can't even be sure there's anything I can do to fix it. The two different hip problems are major, effecting mobility in the case of the big ratchet and transformation in the case of both. The tail fault (which I suspect I have) is manageable. As Nemesis the leg pegs hold it in position. As the base it lies straight on the ground. If standing upright, it bends and rests on the ground. If leaning forward gravity holds it straight. 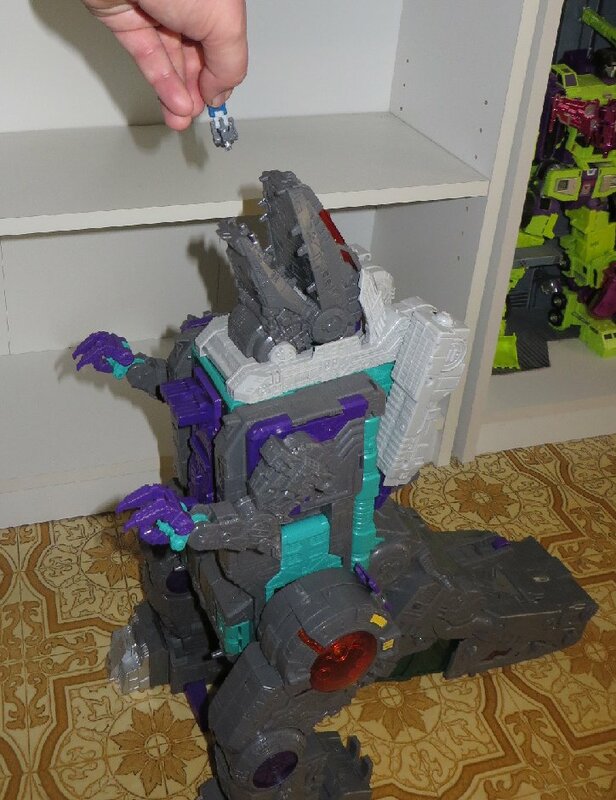 The only time it becomes a real issue is if Trypticon wants to lean forward with the tail raised. Not going there. [UPDATE] Opened up the tail last night and, based on advice frok TFW, glued the toothed ratchet plate into place. There really is no reason for it to not be attached in the first place. The teeth are significantly longer than the tabs holding it in place, a major design flaw in my opinion. The tail now happily locks in both positions, and the ratchet really doesn't feel that tight. Some people are saying that it was only one particular batch of Trypticons that had bad hips. Did anyone here definetly get one with bad hips and if so do you know what the batch number on your box was? I'm afraid to open mine in case it breaks and since I have the Tak/Tom version ordered I can wait for it if necessary. Would really like to open Trypticon though - have been tossing it up for weeks. I wont be opening him up to cut any springs - Im too ham-fisted for that.